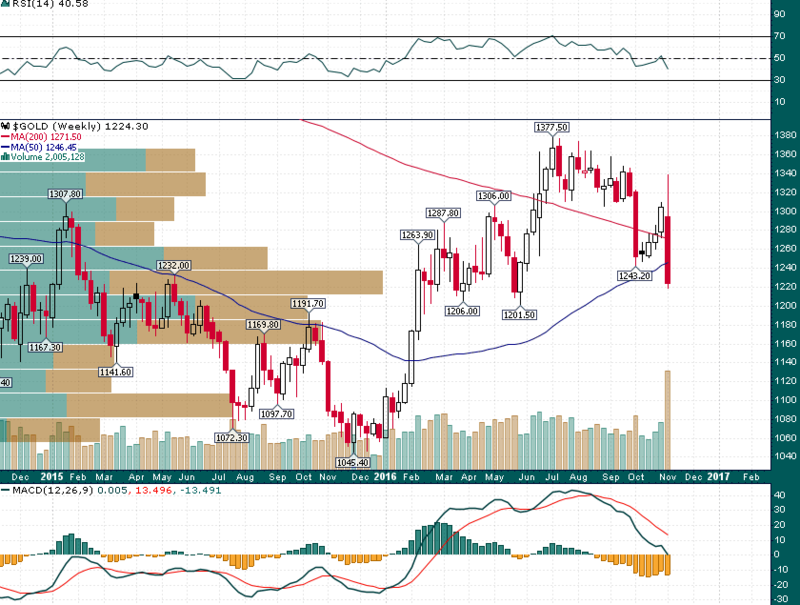 The Seeds of the Next $1,000 Rally in Gold Were Planted Last Week | Energy and Gold Ltd. Allow me to begin by offering an important caveat; my opinions and analysis are not necessarily the truth, I do my best to convey what I think is happening in markets and what is most likely to happen in the future. As Yogi Berra famously stated “it’s tough to make predictions, especially about the future.” Moreover, markets are always changing and in flux, therefore, an analysis today is unlikely to be the same a month from now, much less a year from now. I believe this caveat and a firm understanding that there is so much that we do not know and cannot know is more relevant today than ever before. After all, regardless of all the speculation Trump is a wild card and the implementation and specifics of most of his policy proposals remain unclear or entirely unknown. There seems to have been a consensus among prominent hedge fund managers shortly after it became apparent that Trump was going to win that the dip in equity futures represented a buying opportunity and as Carl Icahn stated Trump is “a positive for our economy, not a negative.” In an instant some very smart, shrewd guys decided that it was time to dump gold and buy stocks. And so it was. As is often the case among the hedge fund crowd a positive feedback cycle gets created and nobody wants to be caught on the wrong side of the move, which only serves to exacerbate short term market gyrations. Regardless of the fact that I think Trump’s Presidency is likely to catalyze gold to new all-time highs last week’s candlestick cannot be ignored. Just when it looked like gold had regained its footing above $1300/oz a deluge of selling caught a huge contingent of investors wrong footed. The weekly candlestick encompasses a nearly 10% weekly range with the largest weekly trading volume on record. While the damage was significant I am not hitting the panic button on gold investments; the week ended with price near the largest volume-by-price bar of the last two years and also just above major support ($1200-$1210). Why the big decline in gold? After all Trump brings a lot of things to the table which one would normally deem as being bullish for gold such as deficit spending (tax cuts with large infrastructure spending programs) and geopolitical uncertainty. However, the market appears to have focused on the prospect of rising inflation, more positive real yields, and tighter Fed monetary policy which will be necessary in order to prevent inflation from running rampant. Perhaps more importantly many hedge funds appear to have taken the emotional market response to Trump’s upset election win as an opportunity to liquidate gold positions. So far they look pretty smart but I would be willing to bet these same funds will be buying back those gold positions within a few months, if not a few weeks. While the move up in real yields has been far from extraordinary, last week’s price action in precious metals is a strong indication that market participants believe yields are heading higher. In one scenario inflation takes off resulting in damaging effects upon the real economy; high inflation and slow growth leads to a stagflationary economic environment similar to the environment which contributed to the 1970s gold bull market. In another scenario Trump’s economic policies (trade protectionism, smaller government, xenophobic immigration policies, etc.) could lead to weakening economic growth and foreign capital fleeing the US dollar and US investments creating a potentially perfect storm for gold. For now optimism seems to be abundant. Even those who voted against Trump have decided to “give him a chance” and the changing of the guard is still more than two months away which allows for plenty of speculation that Trump will backpedal on some of his election promises. However, reality is likely to hit hard come the new year and gold investors are being given an opportunity to reload and/or add to positions at levels which some thought they might never see again. Trump doesn’t fix anything and the change he does bring is likely to be more destabilizing than anything we’ve seen in recent history. Damaging secular demographic trends aren’t changed by lower taxes for the rich or an infrastructure spending program. If you’re a long term gold bull nothing changed last week, in fact your conviction in the long term gold bull market should only be stronger. That doesn’t mean the market won’t occasionally try to shake loose your conviction like it did last week, that’s what markets do. For a shorter term trader it would be reckless to simply go in and buy gold and mining shares after last week’s technical damage, however, a tremendous long term buying opportunity is likely to be weeks, not months away. The seeds of the next $1,000 rally in gold were planted last week. Sign up for CEO Technician Premium to find out how CEO Technician is trading the market volatility in real time with live trade signals, analysis, and updates! DISCLAIMER: The work included in this article is based on SEDAR filings, current events, interviews, and corporate press releases. It may contain errors, and you shouldn’t make any investment decision based solely on what you read here. This publication contains forward-looking statements, including but not limited to comments regarding predictions and projections. Forward-looking statements address future events and conditions and therefore involve inherent risks and uncertainties. Actual results may differ materially from those currently anticipated in such statements. The views expressed in this publication and on the EnergyandGold website do not necessarily reflect the views of Energy and Gold Publishing LTD, publisher of EnergyandGold.com. This publication is provided for informational and entertainment purposes only and is not a recommendation to buy or sell any security. Always thoroughly do your own due diligence and talk to a licensed investment adviser prior to making any investment decisions. Junior resource companies can easily lose 100% of their value so read company profiles onwww.SEDAR.com for important risk disclosures. It’s your money and your responsibility.